This cute tank top from Doggie Skins is a great way to customize a special message for your small or medium dog. It's a great way to spoil your furry friend and take the next step in pet fashion! 5.0 oz, 100% combed ringspun cotton 1x1 baby rib. To help visualize, the average cotton weight of an Adult tee is 5.3 oz. For small to medium dogs only. Please measure your dog before ordering. Let your furry friend help you make the big announcement that you're expecting in the next few months. 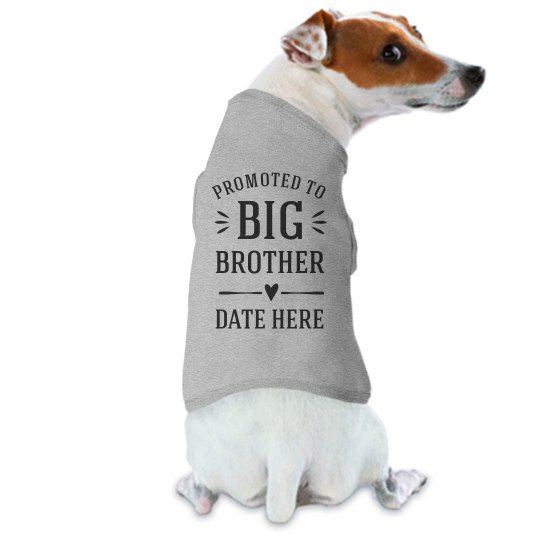 With this customizable doggie shirt, you can put in your date to match when your baby is due to arrive, and gush over how adorable they look! Get yours today.